Peace Corps Director Aaron S. Williams is saddened to announce the death of Peace Corps volunteer Joseph Chow in Tanzania. Joseph died in a rock climbing accident near the village of Mbuji in the Ruvuma region in the southern part of Tanzania. After graduating from Amherst College in 2007, Joseph was invited to serve in Peace Corps/Kenya as a math and science teacher and arrived for his pre-service training in September 2007. He was sworn in as a volunteer in November and placed in the village of Ndalat to teach chemistry and physics at St. Clement Secondary School. Following the suspension of the Peace Corps/Kenya program in early 2008, Joseph volunteered to transfer to Tanzania to continue his service as an education volunteer. In February 2008, he began teaching college preparatory chemistry at Ndanda Secondary School in the Mtwara region of southern Tanzania. A post made on PCOL from volunteers in Tanzania alleges that Ambassador Michael Retzer has acted improperly in revoking the country clearance of Country Director Christine Djondo. A statement from Peace Corps' Press Office says that the Peace Corps strongly disagrees with the ambassador’s decision and that her removal will have an adverse effect on the program in Tanzania. In an apparently unrelated story, the White House has announced that Retzer is being replaced as Ambassador. Our in-depth report follows. 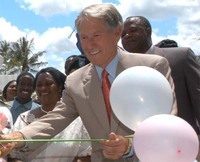 Caption: Ambassador Michael Retzer cuts the ribbon to the new Msata Health Center in Tanzania. We are US Peace Corps volunteers serving in the United Republic of Tanzania. We are writing this letter because the US Ambassador's recent involvement in Peace Corps Tanzania has outraged us and inspired us to seek answers from our elected officials back home. Tanzania's United States Ambassador, Michael Retzer, recently chose to curtail the country clearance of our Peace Corps Country Director, Christine Djondo, after she refused to resign her position and leave voluntarily. The Ambassador illegitimately removed Ms. Djondo from her position for defending the rights of Peace Corps. We as Peace Corps Volunteers in Tanzania are appalled that a public official used his office to coerce a federal employee into advancing his political agenda. This is a formal expression of our opposition to Ambassador Retzer's decision, and we request an investigation of this matter. While the United States government supervises the Peace Corps, the program was specifically designed to keep us volunteers separate from US Embassies and their political affiliations. Disregarding this precaution, Ambassador Michael Retzer pressured our Country Director to merge the operations of Peace Corps/ Tanzania and the US Embassy by co-locating the President's Emergency Plan for AIDS Relief (PEPFAR) office at the Embassy. Furthermore, he wanted to combine the Embassy's and the Peace Corps' Motor Pools and Health units in order to reduce the budget of the United States Mission. In these situations, Ambassador Retzer allowed Ms. Djondo no opportunity for compromise. Peace Corps has remained independent since its inception in 1961 and it is indisputable that the Ambassador's demands infringed upon its sovereignty as a unique and autonomous organization. Furthermore, by disrespecting Peace Corps' independence in relation to the hiring and firing of staff members, some of Ambassador Retzer's plans may be considered in contempt of the Peace Corps Act (Section 2509A). A United States Ambassador does not have the power to fire a Peace Corps Country Director: only the Director of the US Peace Corps in Washington has the entitlement to appoint or dismiss a Country Director. Consequently, Ambassador Retzer's only means to remove Ms. Djondo was to take the drastic step of revoking her country clearance. The Ambassador claimed to have little confidence in Director Djondo's leadership ability and therefore made this decision in order to "save" our program. Ambassador Retzer's agenda for PC/Tanzania could have had a devastating effect on our safety, our relationships in our communities, and on our morale as independent volunteers. We firmly believe Ms. Djondo made the right decision in resisting his intimidation. Ms. Djondo worked diligently to effectively and safely direct our program and continually demonstrated excellent leadership. We thank her for adamantly defending Peace Corps' independence, for consistently upholding the ideals stated in the Peace Corps Act, and for tirelessly supporting the needs of her volunteers despite political pressures that ultimately forced her to leave the country. On June 8, 2007, the date designated by Ambassador Retzer, Ms. Djondo and her family left Tanzania for Washington DC where she will retain a position at Peace Corps Headquarters. We believe Ms. Djondo has been punished by Ambassador Retzer for defending the security of Peace Corps Volunteers. We are writing today to express our disbelief and indignation at Mr. Retzer's audacious behavior as a public official. As current and former Peace Corps Volunteers and citizens of the United States of America, we kindly request investigation into his potential misuse of power. If questions or comments, feel free to contact: pcvsbehindchristine@yahoo.com This is an address created by the many PCVs in country in support of Christine! We will respond at our earliest convenience. Asante sana. Christine Djondo served in Tanzania for nearly two years and also served with distinction as the Peace Corps Country Director in Lesotho and Gabon. She has demonstrated the leadership and management qualities that exemplify a successful country director. She has accomplished a great deal as the country director of one of Peace Corps’ largest and most successful programs in all of Africa, supporting both Volunteers and staff and maintaining strong relations with the Government of Tanzania. During her tenure as country director in Tanzania, there has been a pronounced increase in Volunteer satisfaction with their experience and the support they receive from staff. The Peace Corps has always had full confidence in Ms. Djondo as country director. Unfortunately, U.S. Ambassador Michael Retzer did not concur and has exercised his authority as chief of mission to withdraw the authorization for Ms. Djondo to remain in country. Peace Corps strongly disagrees with the ambassador’s decision and has let him know the adverse effects this decision will have on the Peace Corps program in Tanzania, including the morale of Volunteers, new trainees, and staff. Because of the number of staff transitions in Tanzania, the June training class is being reduced by half to ensure adequate support for currently serving Volunteers and the new training class. The Peace Corps has always maintained an excellent partnership with the government of Tanzania, which has given strong support to the Peace Corps program at the national and local levels. The Peace Corps is proud of its relationship with Tanzania, one that began when the first ever Peace Corps Volunteers arrived in August, 1961, and the agency looks forward to continuing its strong partnership. Christine A. Djondo has been Peace Corps Country Director in Lesotho, Gabon, and Tanzania. She is a Returned Peace Corps Volunteer who served in Cameroon for four years between 1984 and 1989 working with Credit Unions and Cooperatives. She served as Country Director for Lesotho from 2001 to 2003, Country Director for Gabon from 2003 to 2005, and Country Director for Tanzania from 2005 to the present. Prior to returning to the Peace Corps in a staff position, she was the Senior Program Officer for Special Programs at the Council for International Exchange of Scholars (CIES). In this capacity, she worked with the Fulbright Scholar-in-Residence and Occasional Lecturer Programs, which are aimed at helping to internationalize minority-serving institutions, community colleges and those colleges in the United States that normally do not have the opportunity to host a foreign scholar. She also helped plan the annual visiting scholar conference, worked with the metropolitan coordinators and assisted with diversity issues at CIES. Ms. Djondo previously worked for CIES for five years in the early nineties when she was a Program Officer for Africa programs. In the four years she was away from CIES, she worked for the Institute of International Education (IIE) on USAID training programs with Egypt, South Africa, Namibia, the Philippines and Panama. She also served as the Assistant Director of Education Abroad at Ohio University in Athens. Ms. Djondo is very involved with the African Studies Association and NAFSA: Association of International Educators where she has chaired several panels and a workshop on Africa. She recently served as Co-Chair for the Virginia Delegation to the National Summit on Africa held in D.C. this past February. Ms. Djondo has an M.A. in African Studies from Ohio University, Athens; a B.S. in Human Development from the University of Connecticut, Storrs; and an A.S. in Accounting and Business Administration from Manchester Community College, CT. Ms. Djondo also served and worked for the U.S. Peace Corps in Cameroon for four years. Read more about Peace Corps Tanzania, one of the first countries that welcomed the Peace Corps. 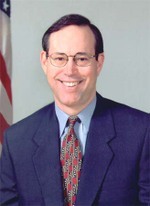 Ohio Governor Bob Taft will go full circle in January when he leaves office and returns to the roots of his public service some 40 years ago. He said one of the first things he and his wife, Hope, plan to do is to visit Tanzania, the African country where Taft served as an idealistic Peace Corps volunteer teacher in the 1960s. A black-and-white picture of a younger, thinner Taft digging a ditch in Africa was used in Taft campaign ads and is prominently featured near the front of The Taft Years, a 128-page state-published book detailing his tenure as governor. Read more. He left an enduring mark on Ohio by funding the largest school construction program in history, establishing the Third Frontier job-creation program and overhauling the state’s antiquated tax code. "Fifteen, 20 years from now, I think Taft will go down as one of the smartest and most accomplished governors we’ve had," Ohio Republican Chairman Robert T. Bennett said Friday. Taft’s legal troubles resulted from his failure to report on his annual financial-disclosure forms 52 golf outings, meals, hockey tickets and other gifts worth almost $6,000 since 1998. By law, all gifts of $75 or more must be disclosed to the public. "Obviously, I made a mistake. ... I’m the governor. I’m the one that’s responsible for making sure it’s accurate, and it wasn’t. That’s why I took responsibility. It was the right thing to do." Ohio Governor Robert Taft served as a Peace Corps Volunteer in Tanzania in the 1960's. Read more. Nobody thinks Bob Taft is corrupt. The violation was the result of sloppiness. A lot of Republicans did think the governor was too weak to be worth defending from his own mistakes. He was also hurt politically by the fact that, on his watch, the performance of the Ohio economy generally ran behind that of the nation. But the truth is that governors don't have much control over that sort of thing. The real case against Bob Taft is that he never emerged as a forceful leader on a wide range of subjects. There was little in the way of a Taft legislative program that was strikingly bold. He seldom used the governor's pulpit to get something important done -- or stopped. And yet, with nearly all said and done, there is a clear legacy. His baby -- the Third Frontier, his effort to use state money to seed high-tech research in a formerly blue-collar, low-tech state -- is in place. The task of getting it there did not go smoothly, and the size still isn't what he had hoped for. But it's there, with a high profile, and it could grow. Read more.